IGTV for business is here! If you have heard it once, you’ve probably heard it a thousand times by now… video is the future of the internet and social media. For the last several years experts, analysts, and researchers have predicted that a majority of mobile web traffic would be video by 2020. And actually, a recent stat that I saw in Adweek said that 80% of mobile web traffic will be video by 2019, which is practically here. Video is everywhere now! YouTube was the original video platform, but now with literally every social media platform supporting video, it is getting easier and less scary for creators to jump on the video wagon. Instagram Stories and Snapchat eased us all in to creating video only requiring us to put our faces in front of the camera for a few seconds at a time. The ultimate warm up, no? Well, now it’s actually socially acceptable to hold your phone to record, and even share vertical videos now. In fact, apparently 94% of people hold their phone vertically to capture video! Who would have thought? This article will be a living resource, and as I write more about IGTV it will be updated to include links to all of the other content I create about it. There is a lot here, so I’ve created a “Table of Contents” to make it easy for you to click and jump to the section you want. 1. Do I need to jump on IGTV Now? Do I Need to Jump on IGTV Now? First, I want to stress that there is no indication that uploading video to IGTV will help your posts in the main feed. 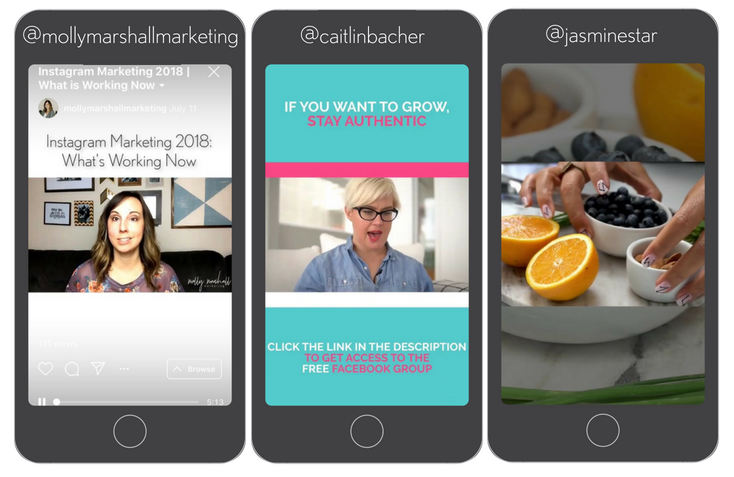 A few months ago, Instagram opened up about their algorithm, and one thing they said was that using Stories did not impact your position in the main feed. I’m using this to deduce that it will be the same for IGTV. In talking about IGTV, Instagram has said that this is just another way for creators to connect with their audience, so think about it in this way. This is just another avenue for you to create and share content that helps your audience. However, Instagram always loves their new features. IGTV will be something that they really want people to adopt, so they will prioritize it by making it prominent throughout the app. I believe it is always smart to adopt early while competition is low! If you get on IGTV now and start creating content, you have a better chance of being found, than when everyone else is on it too! IGTV is not YouTube, and it has its own quirks and nuances. Here are a few of the IGTV features that I am most excited about! It lives “forever” – everyone keeps saying that it is “like YouTube,” and while there are many big differences, that is a convenient way to explain it. You upload a video and it lives on your channel until you take it off. The official Instagram press announcement says that you can upload videos up to 1 hour long, but I haven’t heard of anyone that has the ability to upload videos that long that yet. For now you can upload videos up to 10 or 15 minutes long. 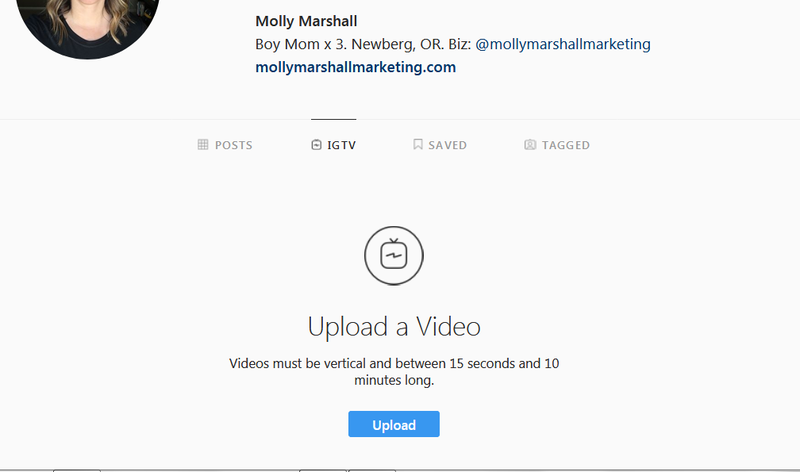 I have access to 6 different Instagram accounts, and half of them allow a video upload of 15 seconds to 10 minutes long, and the other half allow video uploads to 15 minutes long. Who knows why? Instagram likes to keep us on our toes. You don’t have to have a business account to enjoy the benefits of an IGTV channel, even personal accounts can create their IGTV channel. Just think, when someone visits your profile for the first time to decide if they want to follow you, they can dive right in and get lost in your video content! Did you know that links you include in your video descriptions are live? Meaning, users can click on links and be taken to a web page within the Instagram app. Put links to a full blog post, or your opt-in, or…. whatever you want people to click on for more information. This works on personal and business accounts with any number of followers. Hallelujah! For creators that have the ability to add links to their Instagram Stories (for now, that’s business profiles with 10k or more followers), you can actually link IGTV videos in your Stories! 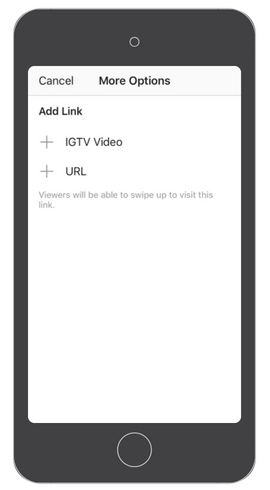 When you add a segment to Stories (either a photo or a video), and click the “Link” icon, you now have two options: to either add a URL, or pick an IGTV video to send people to. When I add a new video to IGTV, I like to go to my Instagram Stories to record a little 15-second “teaser,” then link the IGTV video to that segment. It’s a great way to direct people to your new videos. 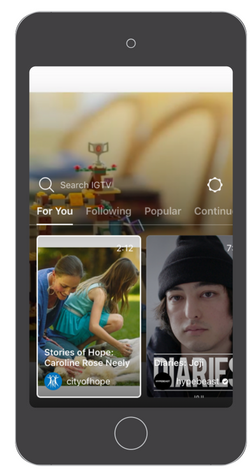 In my opinion, discovery on IGTV is pretty limited. If you start to type in keywords about something you want to watch in the “Search IGTV” space, Instagram profiles populate by username/name field. So if you are looking for “Paleo Recipes,” you better hope that an account with killer IGTV content around paleo recipes is including those EXACT words in either their username or name field on their Instagram Profile. On the main IGTV screen you can scroll over to “Popular” but these appear to be selected especially for you, by Instagram (using an algorithm, of course!) I logged in to five different Instagram accounts and got five different “Popular” results. 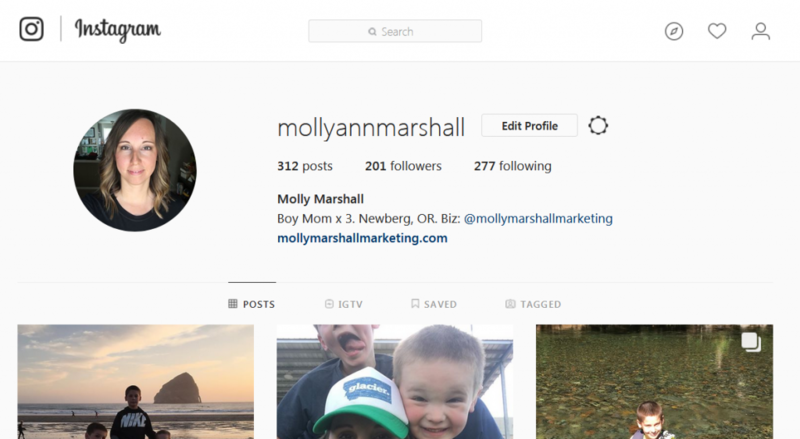 I’ve talked about the “Explore” tab on Instagram before, and how the content here is based on the content you follow and interact with on Instagram. IGTV Popular appears to be no different! 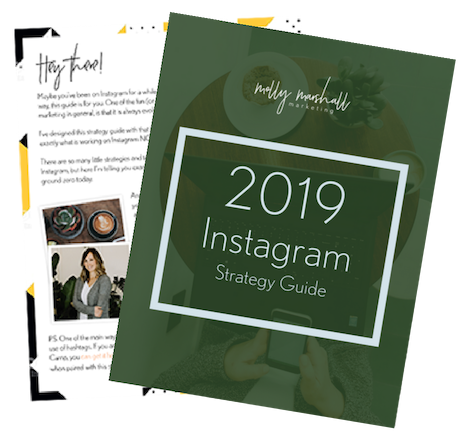 In Instagram’s own words, “This an exciting opportunity for you to get closer to your fans, explore your creativity, grow your audience, and build your brand.” Yes! All these things. To really make the most of your IGTV content, I’ve put together 9 “best practices” or helpful ideas to get you started rocking IGTV right away. Even though, as of the publishing of this article, there is no way to search for content based on the keywords in the title and description of a video, I still think you should work hard on these. If you are already spending time carefully naming your blog posts and YouTube videos with appropriate keywords for getting found, why not apply that here? Please, please, please name your videos with a title that clearly tells us what the content of the video is. I can’t tell you how many, “LOL! This was so funny (emoji, emoji, emoji)” titles I’ve seen. Uh, SKIP. If you want people to pay attention, tell them what you have to offer. The same goes for descriptions! Give us a little summary of what you are sharing in the article. Start with something attention grabbing, just like you would for a great Instagram caption, or a scroll-stopper at the beginning of an Instagram or Facebook ad. The first line should pique interest and get us to want to watch your video. Did you know that any URL that you put in the description is actually clickable? Heck yes. Put a link to your freebie or opt-in, a link to your website, your latest blog post, or… the sky is the limit. Remember that with your free marketing content, you just want to get people to take the next logical step with you. So what is that next step? When it comes to the actual content of your video, there are hundreds of ideas. When we talk about video content, we put a lot of emphasis on the visual aspect, but honestly, crappy audio is a HUGE no-no. I really believe that people will put up with sub-par lighting or video quality if they can hear what you have to share. At least that way they can still get the information. However, if the audio is bad, too quiet or there is a lot of background noise, most people will give up. Invest in an inexpensive lapel microphone. This is the one I use (this is an affiliate link): Movo PM10 Deluxe Lavalier Lapel Clip-on Microphone. Anything helps and it doesn’t have to be fancy. If you are looking for more suggestions, or apps for Android, I suggest downloading Instagram’s IGTV Creator Guide. It’s amazing and goes even more in depth on creating and editing video content for IGTV! Just like on YouTube, you have the option of uploading a custom thumbnail for your videos. Sure, you can just pick a random frame from your video of your face all scrunched up, OR you can design something nice and simple in Canva, and use that instead. Take control of your brand and do the custom thumbnail! 6. Let Your Instagram LIVE Survive! When you are finished with an Instagram live, don’t forget to save it to your phone’s camera roll! If it is less than 15 minutes (or 10 minutes, depending on what IG allows you to do), you can upload that right back up on IGTV. Woohoo! I feel like I keep talking about YouTube here, but another best practice idea taken from YouTube marketers is to create your own “channel trailer” to instantly tell people what you are all about. Think of it as an introduction. When people find you or meet you for the first time, what do they need to know? Answer the “who, what, when, where, why” questions. Tell them who you are, why you are credible, what you talk about, what is in it for them, and when you will post content. Engagement is ON PURPOSE. It can be created by you! Ask people to tell you something or answer a question by sending you a comment. Comments aren’t public to others, but when you can create 2-way conversations with your crowd, something amazing happens to your relationships. A bonus tip here is to also include a call to action in each video. Make sure you remind people to subscribe and/or check out the link in the video description! Just like anything else, if you want IGTV to grow, you need to promote it. Creating a video to upload and then just sitting back and expecting people to show up isn’t going to work here. Share in your Stories. 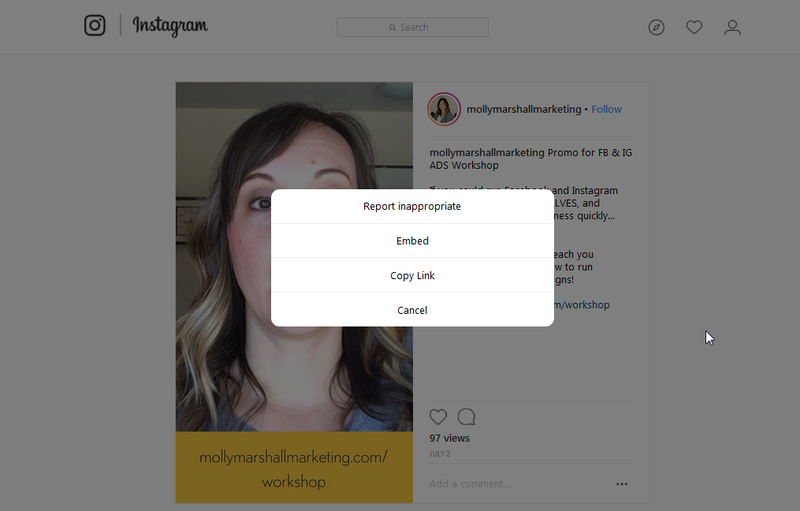 If you have the ability to add links in your Story (business accounts with 10k+ followers), then include a link to your latest IGTV video. 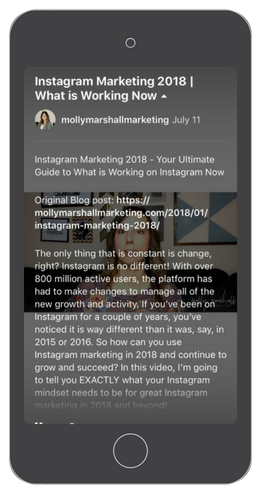 If you can’t insert links in your Stories, then just pop on to let people know they should head over to your IGTV channel. When you upload your video, tick the “Share on Facebook” toggle so that the video will go to your Facebook page (or potentially Facebook Watch.) Keep in mind that your title/description will become the caption on Facebook. Embed your IGTV videos on your website! You need to look at your IGTV video on a desktop, but click the ellipses and you’ll see an “Embed” option. Include it in an email. Head to your home feed. That’s it! 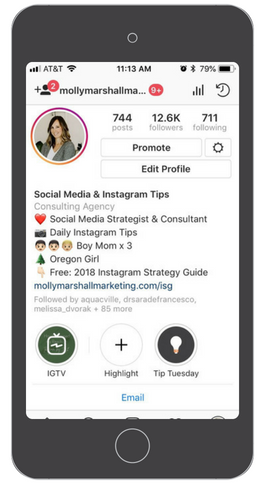 When in IGTV, just click on your Avatar (that’s your little profile photo) to be taken to your IGTV channel at any time. Head to IGTV (via IGTV app or Instagram app). Click on your Avatar (profile photo) to go to your channel. Click the “+” toward the upper right. Select the video you would like uploaded. 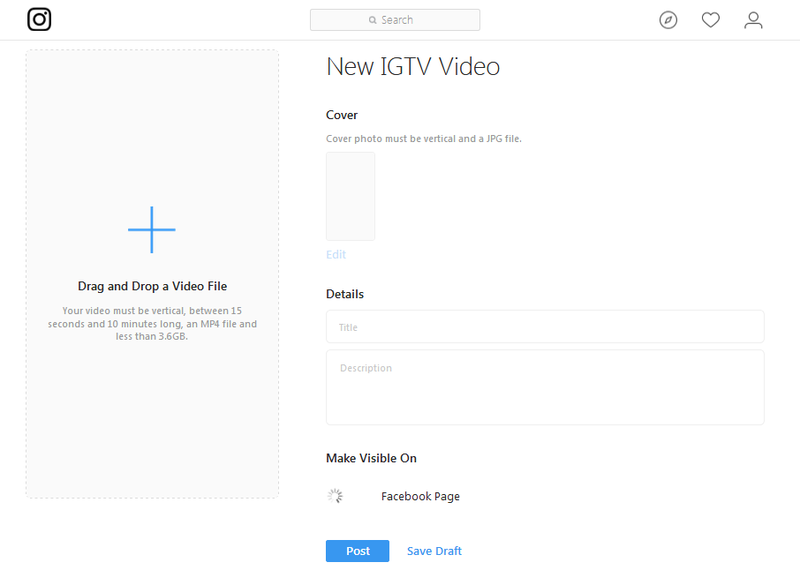 If you prefer, you can also upload IGTV videos on desktop. Sometimes this option is nice for writing your descriptions and such. Click on IGTV below your profile information. Upload your video, a custom thumbnail, and fill out the title and description information. Once you’ve clicked on View Insights, you can see the number of views, the number of likes and/or comments, and the average percentage watched. Under the average percentage watched, you can scroll down to see where people were dropping off. Insights are only informational until you take action. There are a few things that are important to pay attention to and monitor here. Views: If you want to grow your IGTV, you’ll want these to be going up. You can try various ways to drive traffic to your videos and watch what happens with viewership. Is it effective to share them in your Stories? What about a link directly to the video in an email? 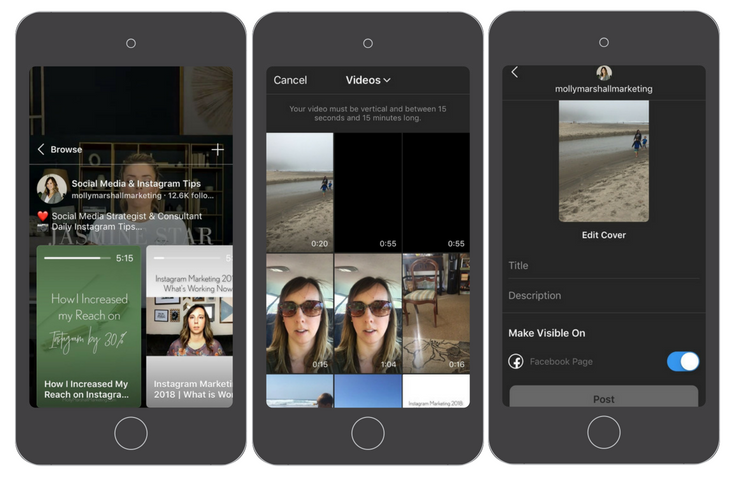 You can even embed videos on your website (see more about this under “IGTV Content Best Practices”.) Set goals for your viewership and create a plan to get there! Audience Retention: Instagram shows you the average amount of a given video that was watched, by a percentage. And below that, they show you a graph that shows where the major drop offs are. A “good” average watch time is really difficult to pin down because there are so many factors: length of video, the amount of value you are providing, the intent of the watcher/searcher, your industry or niche… the list goes on! Where you see significant “drops” in your video, go back and see what you were sharing at that time, and try to figure out why people stopped watching! Marketing is all about incremental improvements, and it takes a while to get a “feel” for things sometimes. Don’t stress! Just try to be a little better each time. You may have some horizontal video that you’ve created for YouTube, or maybe you have a collection of Facebook Lives that you can download and would love to put to good use. There is some good news here! 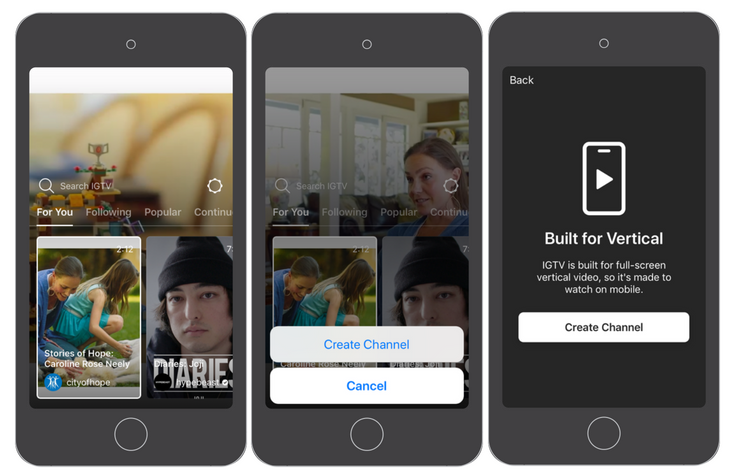 There are two ways that you can use these on vertical-only IGTV. If you don’t have video editing software, you can hire someone to do this for you on a site like Upwork (my preference) or Fiverr for $20 or so. 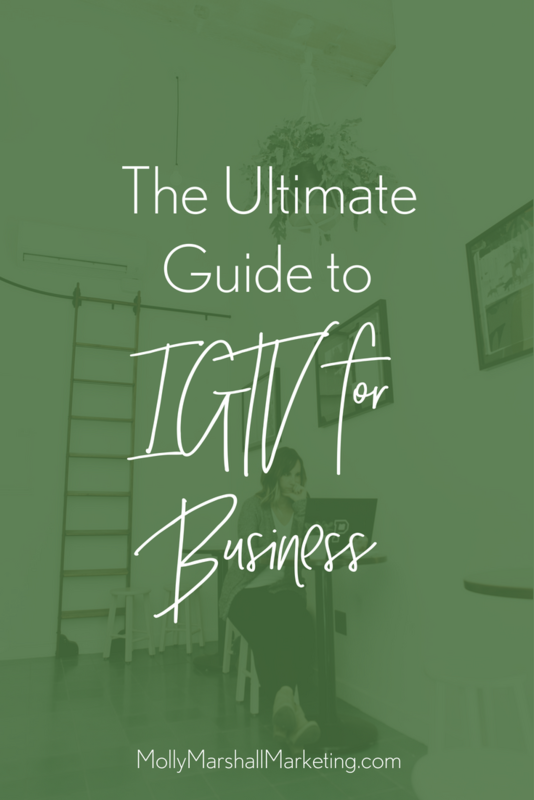 Here are a few of the resources that I suggest you check out to really dive deep in to all that IGTV has to offer us as creators and business owners! This is fantastic Molly! 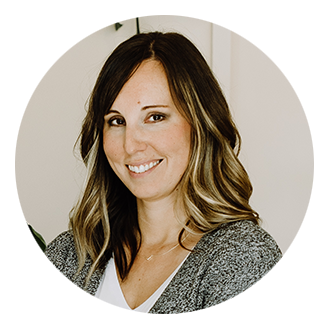 Thank you so much for sharing these tips, I think my favourite would be what you’ve shared around increasing viewership and retention.